and the people iit touched. chernobyl info and photo journals. What was Gained from Chernobyl? First off we used a Specialized Stumpjumper for me and a Janis Durango front suspension bike for Emmanuelle. The modifications to the bikes were slow and difficult due to the fact that we had suspension systems that did not allow factory hardware to be attached. Christians bike went through massive changes due to the odd construction of the full suspension system. finding parts for this system would proove to be impossible but the full suspension bike mad it possible to tour through questionable roads for the duration of the trip. The first modification was to limit the weight on the suspension system and restrict the added forces to the rigid parts that touched the ground. We needed to attach the rack system to the lower arm of the front suspension and the drop out arm on the full suspension bike. We then, of course, attached everything we could to the frames like a 4 litre supply of water, extra water bottles, locks and gel seats that would prove to be indespensable. 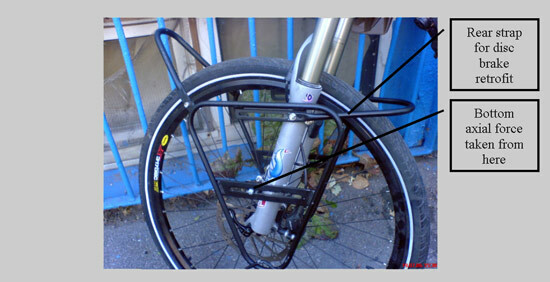 slight modifications to the front rack hangers had to be effectuated because the main support of stock racks hang on the front brakes. Both bikes having disc brakes complicated the assembly and an alternative had to be found. A rear bar that served as a support for the axial forces as well as metal clamps were incorporated into the design. 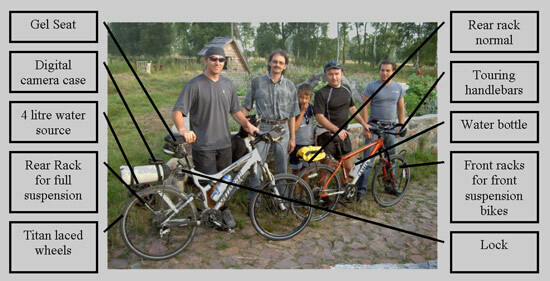 The picture above shows the ultimate modifications to the stock bikes. Even here in switzerland it was difficult to find the proper parts as there is not many people who use full suspension bikes on long distance trips. The next thing that we had to do is find the bags that would contain all of our equipment.